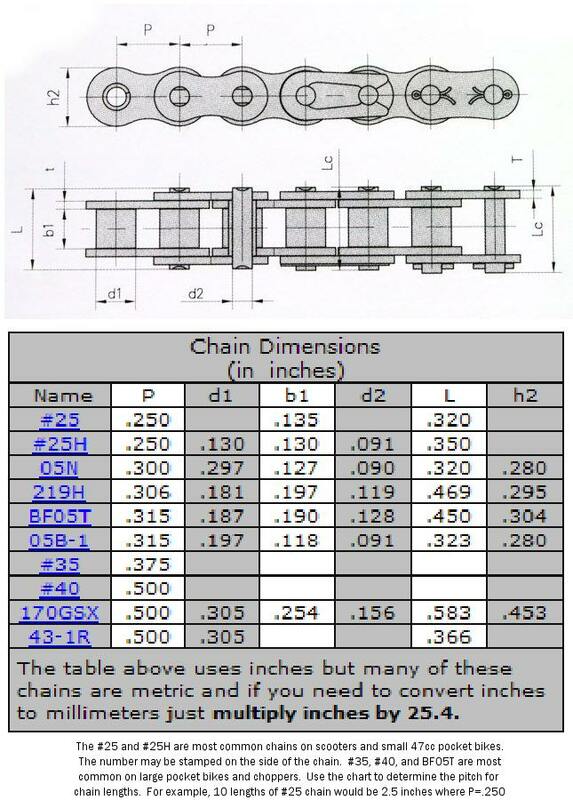 Chain can be purchased precut to length for your need by specifying the number of outside links and inches needed in the size chain, commonly #25, #25H, 8mm or BF05T, and #35. See the Chain Chart for more information on Chain numbers. Chains are also available as premade OEM lengths for specific models. X-treme scooter model parts pages will list more OEM Chains. Chain can be purchased in general lengths with master links and offset links. Sprockets are available for motors and rear wheels in these chain sizes, too. Sprockets attach to motors and rear wheels in different ways and information is provided for measurements where required. CHAINS in #25, #25H, #35 SIZE. 3 FEET OR LESS, $12.95 EA, CUT TO LENGTH. Be sure to include the length of your chain in the Message Area of the order with the number of outside links and total inches preferred (do this during check out; if no information is received then 3 feet uncut will be shipped). 1 inch is two outside links for #25 chain, or 24 links per foot. See the Chain Chart for more information. Order MasterLink Separately in the right column! CHAINS in #BF05T (8mm). 3 FEET OR LESS, $14.95 EA, CUT TO LENGTH. Be sure to include the length of your chain in the Message Area of the order with the number of outside links and total inches preferred (do this during check out; if no information is received then 3 feet uncut will be shipped). See the Chain Chart for more information. Order MasterLink separately in right column. BF05T has 19 links per foot. Be sure to include the length of your chain in the Message Area of the order with the number of outside links and total inches preferred (do this during check out; if no information is received then 29 inches uncut will be shipped). 19 outside links per foot. Use standard 8mm Master Links in right column. This is necessary to pay the cost of shipping and handling. Chain Master Links and Offset Links (offset extends by one link). Pricing is per masterlink or offsetlink (1/2 link) when ordered with a chain or other items. Otherwise when ordering only links the minimal shipping is $1.50 and must be included using the Shopping Cart button in the previous column. Dual chain splitter for #25/25H and T8F 8mm Chains. Works by pushing out the connecting pin. 47, 55, 65 and 80 tooth rear wheel sprockets for #25/25H Chain size and 44 tooth for 8mm (BF05T) chain. Standard 4 bolt mount at 47mm bolt hole spacing and 54mm inner diameter (2 1/8 inch). 68 Tooth, 3 hole, 5.5 inches in Diameter, 32.5mm Bolt Hole Spacing, Uses #25H Chain, ID of center hole 26 mm. 55 Tooth, 3 hole, Outer Diameter: 114mm (4.5 inches). 47 Tooth, 3 hole, 97mm (3.84") Diameter, 33.5mm (1.32") bolt hole spacing, with inside diameter of 29mm (1.14"). 44 Tooth for 8mm chain, 3 hole, 4.5" Diameter, 13mm bolt spacing, with inside diameter hole of 28.7mm. 11 and 13 tooth sprocket for motors. 13 tooth is 1 1/2 diameter for increased speed. 11 tooth is 1 inch diameter. Double D is for MY1020 motors and 10mm shaft. D is for MY1016 motors and 8mm shaft. #25 chain. 9 tooth D bicycle chain sprocket for MY1016 motors. Outer Diameter: 1-5/8'' / 41mm, Inner Diameter: 0.393'' / 10mm. 1/2'' x 1/8'' bicycle chain is also referred to as 410 chain. This sprocket is designed for use with the MY1016 series of motors that have a 10mm single d-bore shaft. 11 tooth double D bicycle chain sprocket for motors. Outer Diameter: 1-15/16'' / 48.8mm, Inner Diameter: 0.393'' / 10mm. 1/2'' x 1/8'' bicycle chain is also referred to as 410 chain. This sprocket is designed for use with the MY1020 series of motors that have a 10mm dual d-bore shaft. 1-1/8" OD, 10mm ID. This #25 chain sprocket attaches to the motor shaft with included 3mm x 20mm roll pin. Foot Plate in Red, Yellow, Blue, or Black. Specify color or receive available stock. Size based on 30 pound weight. Replaces broken or stripped folding mechanism!! Collar Latch for most 100 watt scooters. Handlebar End Set for X-010 or X-11 Models. Detent ball for secure attachment. Diminsions: OD - 1 7/16, ID - 1 3/16 inch. Colors may be limited at times. Specify color choice desired in order message: Burgandy, Blue, Yellow, Black. Otherwise we will send available color. Heavy duty metal frame with kick stand. Use this chassis to build your own scooter using the parts you select. It has a seat pole support, and room for three 12volt 12amp batteries and electronics. 350 or smaller motors mount of the back area above the rear wheel, but larger motors can mount under the chassis in front of the rear wheel. Style lends itself to many user modifications. Typical body cover available above. 30 pounds shipping weight due to oversize carton. Actualy 15 pounds for use yet very well made for up to 250 pound rider. Scratch and dent Only. In reasonable condition. Colors may be limited at times. Burgandy, Blue, Yellow, Black. Trunk with hinges, lock, and mounting hardware. Colors may be limited at times. Specify color choice desired from drop down menu below: Burgandy, Blue, Yellow, Black. Trunk does NOT include hinge or lock. Complete Upper Handlebar for the X-360s! Complete Upper Handlebar compatible with the original X-360s! We advise customer with other brand and model scooters to email us prior to ordering for advisement. A handlebar may appear compatible with other make scooters but be totally incompatible and nonreturnable. Our handlebar assembly can be used with most scooters when the entire assembly is purchased - email for assistance. T-Bar Grip Posts for above new X360 model handlebar. Our lower Fork Assembly with Shocks! We advise customer with other brand and model scooters to email us prior to ordering for advisement. A fork may appear compatible with other make scooters but be totally incompatible and nonreturnable. Our fork assembly can be used with most scooters when the entire assembly is purchased - email for assistance. Diminsions: OD - 1 9/16, ID - 1 5/16 inch. This is a large scooter / bicycle seat replacement. The quality is good, the springs are great and it has good cushion. We offer 3 different seats, this is the best seat we offer. Higher quality than picture indicates. Replacement seat post for most scooter and the X-360 . This item will also fit nearly every other similar looking scooter and many bicycles on the market. Common tools used with the Rad2Go Electric scooters. Includes reversable screw driver, #8/10 wrench, #11/14 wrench, #14/17 wrench, medium and large allen wrenches, zippered fabric pouch. Includes reversable screw driver, #8/10 wrench, #11/14 wrench, #14/17 wrench, small and medium allen wrenches, plastic snap pouch. This is a common gas scooter throttle with switch. Carburetor used on 43cc and 49cc scooter engines commonly found on stand-up gas scooters, pocket bikes, mid/super pocket bikes, mini-choppers as well as some small ATVs and dirt bikes. Venturi Side Opening: 15mm, Bolt Hole Spacing: 31mm, Low speed adjustment, Air Fuel mixture adjustment. No returns, exchange, or allowance provided. Replacement pull starter complete. Fits our XP-490, XG-470, XG-499, XG-505, & XG-550 & ALL other brands that use a pull starter that looks like the one pictured for 33 - 50cc engines. Most popular. When electric scooters first became popular our Throttles, Controllers, Control Boxes, Battery Chargers, Batteries, Brake Levers, Switches, Key Switches, On Off and Kill Switches, Fuses and Fuseholders, Lighting and Signals, and Common Scooter Electrical Components were available for customers in need who otherwise could not get parts for their model scooters. Scooter throttles, battery chargers, control boxes were very hard to find, and still are for quality parts. The difference in our electrical parts from others' electrical scooter parts is that we reject the cheap parts sometimes available to us. Plus, we test the electrical parts we sell prior to shipping them to our customers, adding a little bit to the price but insuring quality. Bottom line - fast receipt of quality electrical and gas scooter parts!